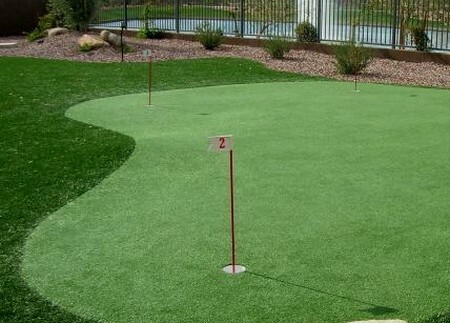 If you have a large backyard and you like playing golf, why not set up your own putting green so that you can practice golf whenever you want? Make putting green as part of your garden as these greens integrate well with the natural colors of gardens. By practicing more, you get to improve your scores and eliminate handicap. Not sure how to build a putting green? Follow these steps and you can start practicing in your own backyard in no time! Inspect your compound to see if the area has good drainage. A good putting green surface should be at least 1000 square feet. The area should also have full sun to ensure optimum growth of the greens, as well as good air flow. If your compound possess these natural advantages, it is suitable for you to build a putting green. Do consult professionals if you are not sure whether your compound is suitable to build putting green. To build a putting green, you will need equipments and tools like a bobcat (hand digging tools if you do not have a bobcat), plastic pipes, irrigation tools, sand, seeds, peat, putting green cups and a cup cutter. You will need to spend a few hundred dollars for these materials but you get to save up a lot as professional planted putting greens will cost at least a few thousand dollars. Take the measurements of the area and go to a supplier for the materials. Then, proceed to build the base of the putting green that consist of a bottom layer of dirt, a layer of crushed stones in the middle for proper drainage and a layer of sand (mixed with peat) on top. You can also use rich growing mixtures as a substitute to the sand and peat mixture. You can also plant irrigation channels to improve irrigation of the area. You will need half a pound of creeping bentgrass seeds for land of 1000 square feet. It can be purchased from local seed supplies. If you are living in warm locations, go for Bermuda grass. Seed the entire area followed by watering the land and applying fertilizers. Affix the putting green cups with a cup cutter. Dig a hole that fits the cup and place the cup in the hole. For professional putting greens, the cup should be one inch below the grass. Generally, this is how to build a putting green but it requires a lot of time and care for these greens. © 2009 Rockwell. All Right Reserved.